Book a skilled gutter cleaning expert in New Orleans. Backed by a total satisfaction guarantee and amazing customer support. There is perhaps no other city in America that combines history, mysticism, and great music quite like New Orleans. They say that Voodoo was first introduced to America here, and the city also hosts the annual New Orleans Jazz and Heritage Festival. It is also the home of the ever-so-popular Mardi Gras Festival, an event which truly reflects what this city is all about. As a resident of New Orleans you should be able to experience all of the fun attractions of the big city and not get stuck at home cleaning your gutters. Let Lawn Love's professional gutter cleaners do this for you. Cleaning gutters can be messy and dangerous, especially if you have a multi-story home. You'll usually have to climb up a ladder so you can reach your gutters, and some folks aren't really too comfortable with doing this. However, your gutters have to be cleaned up regularly if you want them to continue functioning properly because any dirt or debris that accumulates in them can lead to some serious problems. Clogged gutters will not be able to redirect rainwater from your roof, and this can result in severe damage to your home. If your gutters could use a professional touch, then allow us at Lawn Love to clean them up for you. Gutter cleaning is one of the services that our company specializes in, and we have experienced techs who can do the job safely and quickly. You can call now at 504-437-1838 to get in touch with our customer service reps, or you can also get a quick online quote for free. Rated 4.79 / 5 stars in 1,184 New Orleans customer reviews. It looks like the expected precipitation in New Orleans is 0.54 inches, which means your lawn got a nice soaking—leave those sprinklers off today. Dusk and dawn are the best times to water your lawn (the sun will rise at 6:24 AM and set at 7:33 PM today in New Orleans). 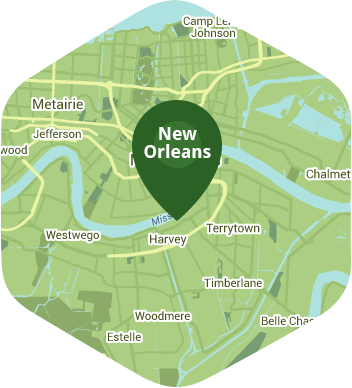 Here are some average lawn care prices for homes in New Orleans. Average lawn size 3,210 sq. ft.